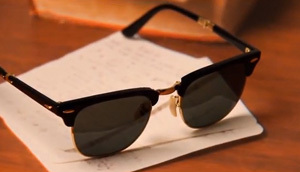 Check out this super clever optical illusion video featuring RayBan sunglasses! The more you watch it, more surprising it gets. Prev These 3 Cars Are Same in Size! wow! those drawing were very deatailed. hmmm!! for some reason i couldn’t reproduce the video on the page, but i searhc it external, and was not much impressive but i like it i give it an 8. I love how the video leads you to believe that you know the pattern and what’s coming with the final zoom-in to the sunglasses…and then it blows your mind one last time. This is stunning. Love the twist at the end. I find it interesting how the images almost snap into perspective at the very last instant. There appears to be very little difference in placement between having the proper perspective and being very noticeably out of perspective. Really cool video. Love the ending! I assume Brusspup did this one for the RayBan channel, considering how much this resembles his work, down to the music used. As usual, pretty good video.